This week, I’ve seen a number of bloggers and websites talking about a new cookbook in which the author basically does exactly the opposite of what you’d think a cookbook author would do: she tells people to forget about recipes. The first few times I saw the book mentioned, I didn’t pay much attention; but by the time it was a topic of conversation over at my blogger buddy Bettina’s site, The Lunch Tray, I knew that I’d definitely want to chime in. My thoughts, after reading a little about this radical new cookbook idea? I think it’s GREAT. I actually don’t tend to use recipes myself, as most of you know by now, and when I do it’s really just as a sort of rough guideline. I’ve written quite a bit before about the death of home cooking in America, but it occurred to me as I pondered the idea of an anti-recipe book that part of the issue is probably our collective need to know that we’re doing something right in the kitchen. People who aren’t comfortable with cooking are often so afraid of doing things wrong that they won’t deviate from recipes at all — leading to those slightly absurd, if totally understandable, situations in which all intentions of making a family meal go by the wayside as the would-be cook discovers the lack of a single ingredient called for by the venerable recipe book. No onion? Panic sets in. Can’t cook tonight. Might as well heat up a microwave meal or call for takeout. No, reliance on recipes certainly doesn’t breed confidence in the kitchen, and it’s no help in creating a nation of people who make their own food, based on what they’ve got on hand and what’s available, fresh, and affordable. So I’ve decided to start a new little project here at RRG…something aimed at showing how simple, unglamorous, and flexible a homecooked meal can be. No fancy ingredients, no complicated directions, and nothing that can’t be changed, substituted, or omitted at your whim. I’m calling this photo diary of a dinner “Fridge to Fork,” and I’m hoping that when people see just how, well, unpretty the whole thing is, it may encourage a few tentative home cooks out there to take some baby steps towards becoming more free in their own kitchens. Yes, you too can make an unglamorous mess of your stove while pulling together a simple supper for the family. This high life isn’t just for food bloggers like me. Bread. Ham. Cheese. Milk. Flour. Butter. Fruits and vegetables. You can use any bread you like. You don’t have to use ham, though it’s traditional — turkey or chicken or even roast beef would be fine. You can use whatever cheeses you like, because I’ll never know. And I don’t care what you serve with it. We just happened to have kale and grapefruit on hand. …and 2 cups of milk/half-and-half added. 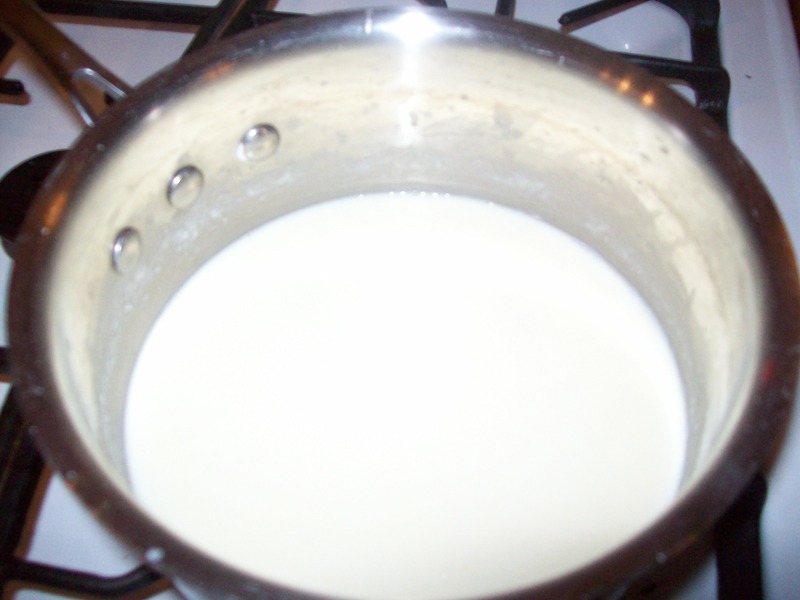 (I use about a cup and a half of milk and a half-cup of half-and-half, for richness. You can use either, both, whatever ratio you’d like.) Salt. Pepper. 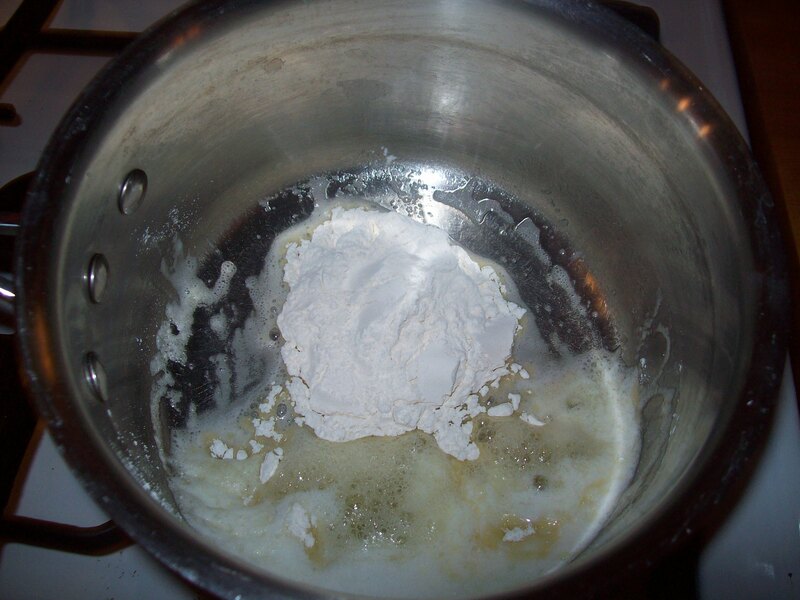 Bubble it away until it coats the back of a spoon, then put a cup of shredded cheese in there and let it melt. Take it off the heat. It’s done. 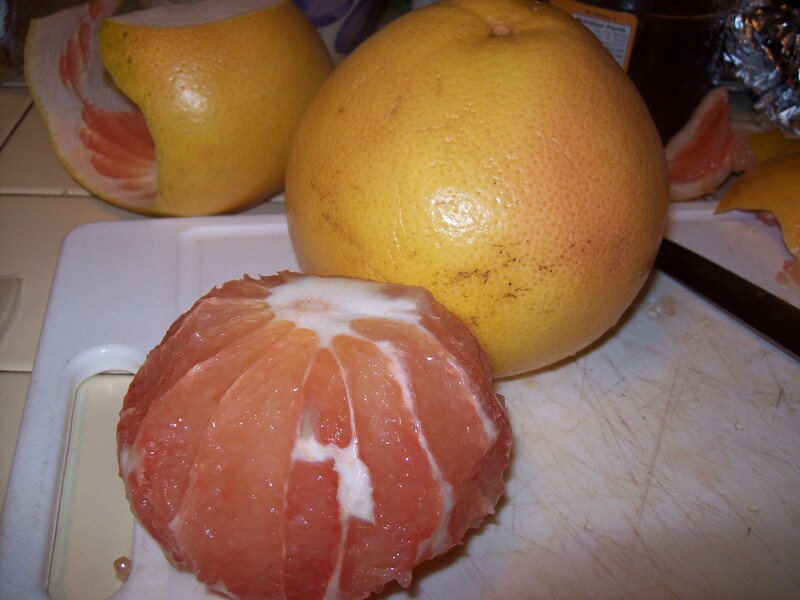 Peeling grapefruit. Again, you could use whatever fruit you wanted. And you don’t have to cook it. But I did. 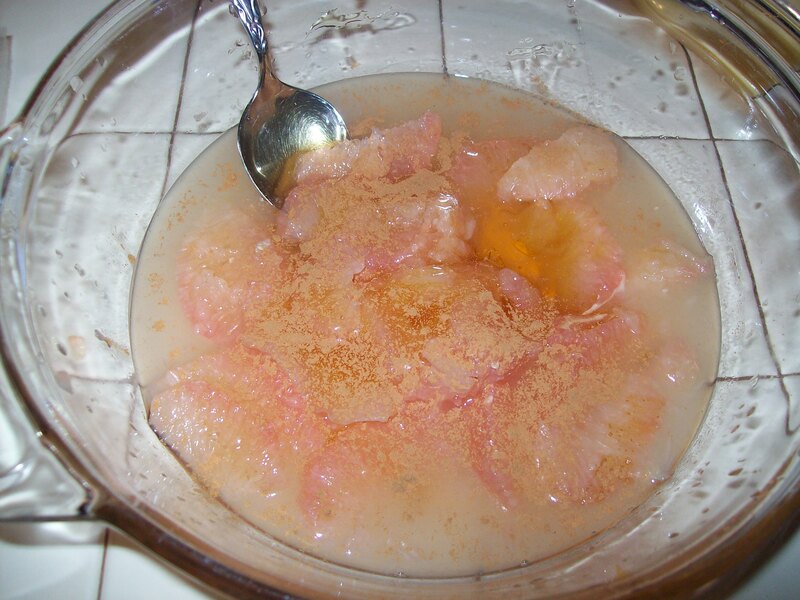 Grapefruit can be a little sour, even slightly bitter, so I tried to make it more enticing for the kids by tossing the segments with honey and cinnamon and broiling it. J. and I were favorably impressed. The boys were not. 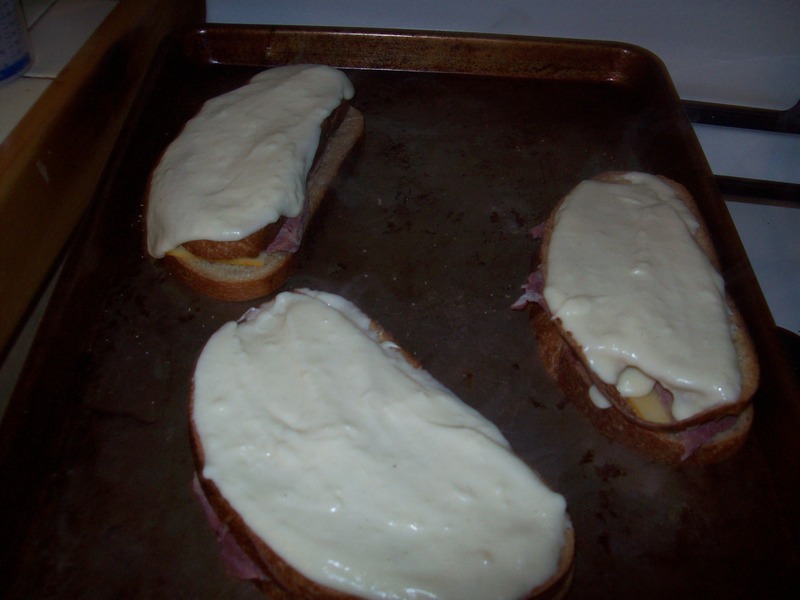 The only secret here is that I toasted the bread first so it wouldn’t be soggy. There’s a little dijon mustard spread on the bread for the adults’ sandwiches, but the kids aren’t keen on mustard so I left it off theirs. You could, too. 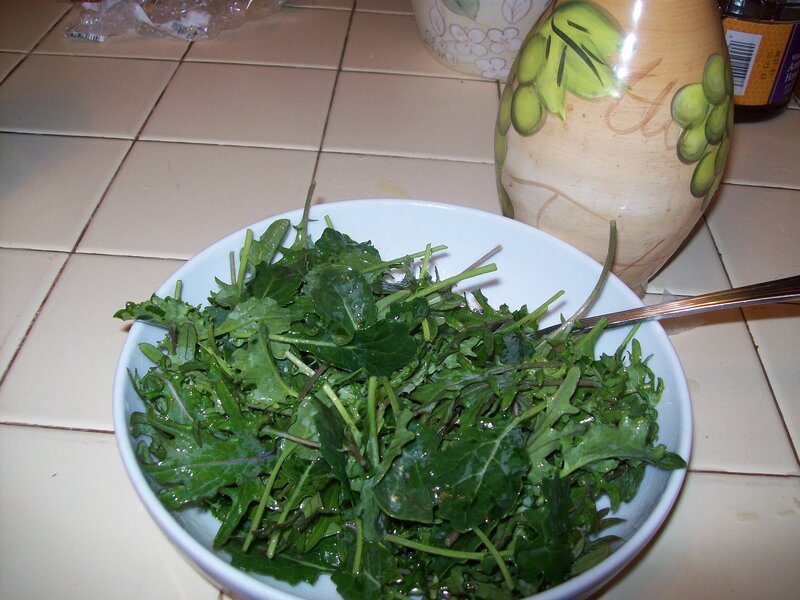 While the sandwiches were under the broiler, what else could I do but get busy tossing some baby kale leaves with salt, pepper, garlic powder, vinegar, and olive oil? You could use different greens or different dressing. Me, I like kale. I had to tell L. three times to keep his mitts off the hot food. I finally handed him a bunch of utensils to carry to the table for me, just so I’d have a chance to dish up the food without him trying to sneak a taste. So it’s just sandwiches, after all. 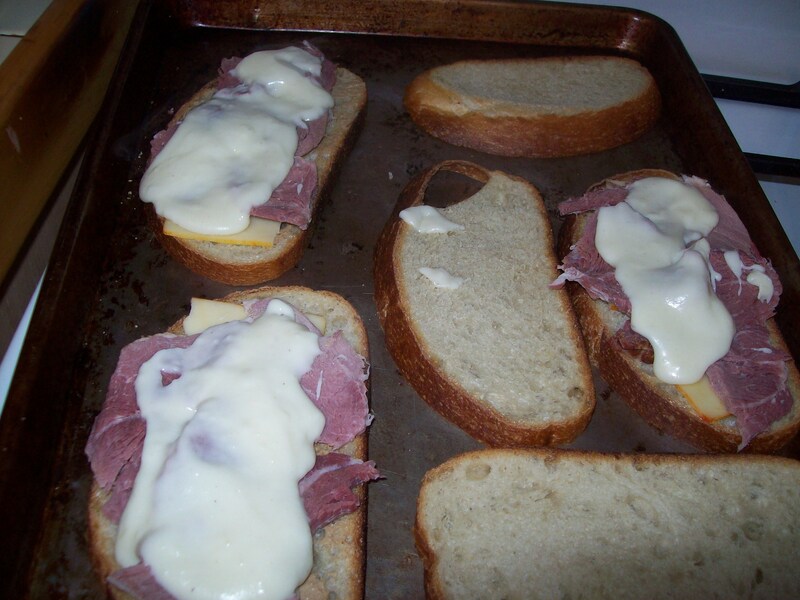 But FANCY FRENCH SANDWICHES. We taught the boys a little smattering of Franglais and made a big deal about how THESE sandwiches had to be eaten with a knife and fork. And darned if all the “Merci” and “S’il vous plait” business didn’t seem to make some bread, ham, and cheese taste extra special, even to me and J. 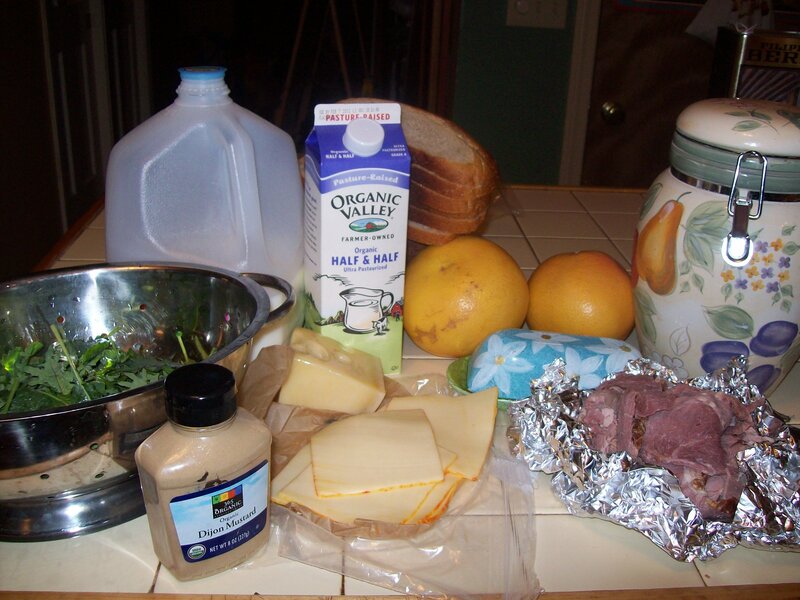 This entry was posted in Accountability, Cooking, Feeding kids, Food culture, Meal planning, Parenting and tagged cooking, family, feeding kids, food, Household organization, Jamie Oliver, kids' health, leftovers, meal planning, parenting, recipes, The Lunch Tray. Bookmark the permalink. This is great! I often use recipes for guidance, but some of my favorite meals have been when I randomly started throwing together ingredients from my fridge and pantry. 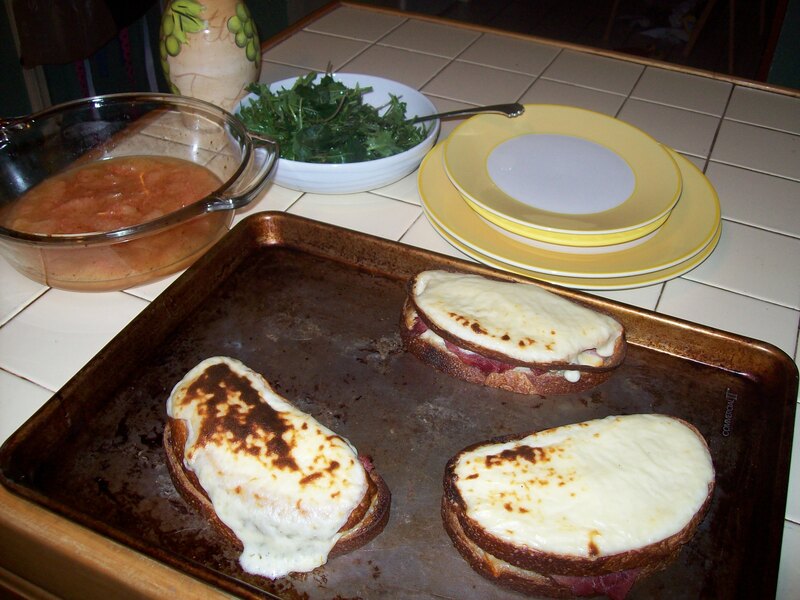 And you show here that a great dinner doesn’t always have to me something you’d find in a gourmet restaurant (although actually I have seen croque monsieur in some great restaurants 😉 – I feel like I’m always trying to tell people who don’t understand how I make dinner every night that I certainly am not making anything complicated most of the time! Thanks, Alissa!� That’s really the crux of the issue, isn’t it?� People sometimes feel, I think, as if dinner has to be a major affair every night.� That old protein, starch, two sides mentality leads us into thinking about Grandma’s meatloaf and mashed potatoes and we sometimes can’t update our thinking.� Simple meals centered around soups, sandwiches, easy pastas, are perfect for busy families — and as long as they are full of variety and lots of produce, they’re just as healthy, if not healthier, than the old-school June Cleaver 2-hours-of-cooking affairs. where’s the “I like” button? 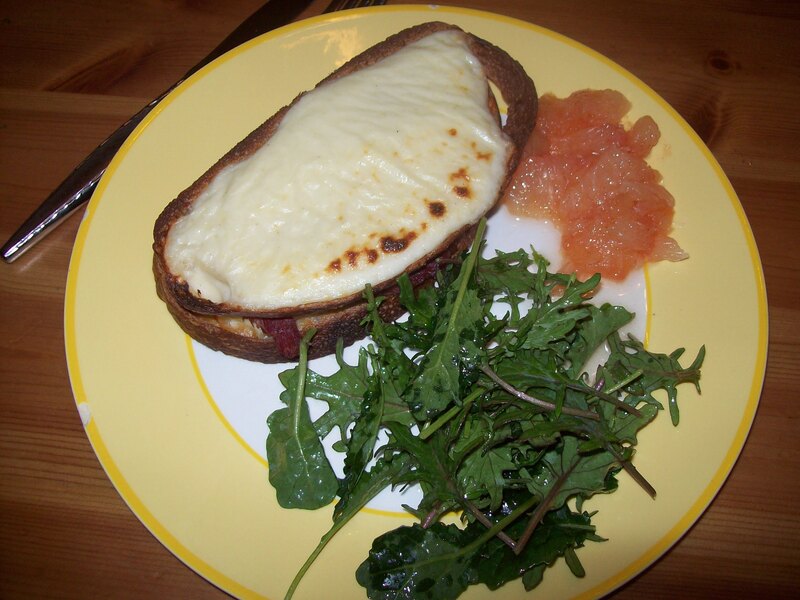 Easy and yummy meal that everyone loves at home ^^ Hmmmm Croque-monsieur !! Good job !! With the salad and the fruits, it looks delicious !! I usually cook without following recipes. When friends ask me about a specific dish they just ate, my answer is pretty much “well, a little bit of this, of that, cooked that long etc…” not really helping lol. That’s what I call the everyday/family cooking. Isn’t it funny how Facebook has taken over our mentality and makes us look for a “like” button on everything? Seriously, life would be so much easier if there were “like” and “dislike” buttons all over the place. 😉 Thanks for the stamp of approval! And, yes, I really have a hard time sometimes pinning down just exactly what I’ve done to make something. I can usually replicate it, but it’s hard to figure out how to explain it. That’s cooking in my world!